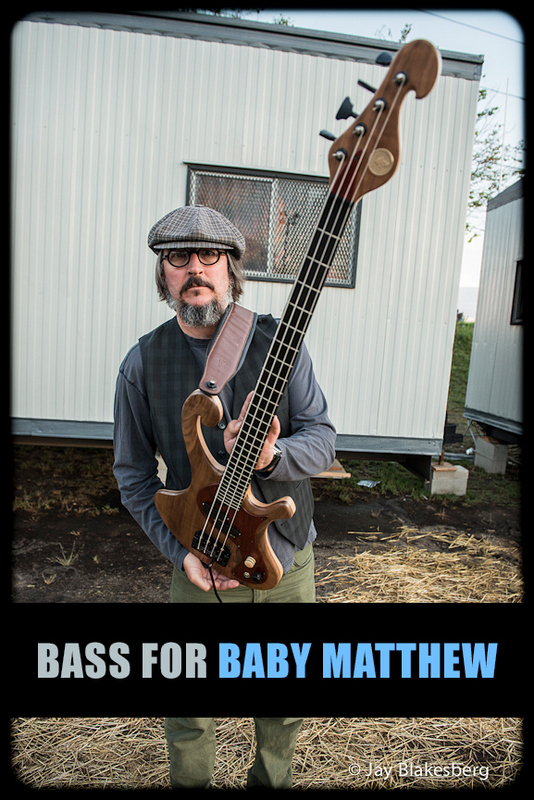 Up for auction is Les Claypool’s PACHYDERM prototype bass. This is one of two original basses that Les has been performing with onstage with Primus for the past couple of years. It is the exact prototype of the PACHYDERM four string basses that are currently being custom made by Les’s longtime friend and luthier, Dan Maloney. These basses were designed by Les Claypool to be the most comfortable and easy to play four string basses to his standards. This particular bass has a walnut top with a maple back and exotic wood pick guard. It is 32” scale with LED lights in the side of the fingerboard and has a Kahler brand tremolo bar. Keeping the electronics simple, Les equips his basses with one single custom split EMG pickup with a single control knob. It has a bronze Pachyderm medallion set into the headstock. This combination of woods and electronics gives this particular bass a warm but punchy attack with a medium finish. These basses are light and extremely comfortable in the lap as well as on strap. Being that this is a prototype for a small run of custom instruments, and it’s a personal instrument of Les’, it is sure to be a collectible item. The instrument can be personalized with a signature by Les if desired and comes with a Gator soft case. **This is a no reserve auction ending at 10:30 am pacific time on Wednesday, August 15th. Once it’s gone, it’s gone so don’t miss out. 100% of the proceeds for this auction will go to help Les’s nephew, Baby Matthew, who has been battling a rare form of infant leukemia since he was two months old. He is now two years old and is undergoing bone marrow transplant therapy. For more information go to babymatthew.org or check out his facebook page under Matthew Robert Pierce. Even though it looks like we are a new eBay seller, this was an account set up specifically for this auction, we do have over 1,000 100% positive feedbacks so bid with confidence! Don’t miss out on this once in a lifetime opportunity and know that you are contributing to a very worthwhile cause in the process. We can ship internationally, but shipping cost is paid for my auction winner and is calculated based on location–contact seller for shipping price if interested. If you have any questions, please use the “contact seller” link above. Good luck in bidding on this rare and exotic instrument.